Not to be confused with Cannabinol or Cannabinodiol. Cannabidiol can be taken into the body in multiple ways, including by inhalation of cannabis smoke or vapor, as an aerosol spray into the cheek, and by mouth. It may be supplied as CBD oil containing only CBD as the active ingredient (no added tetrahydrocannabinol [THC] or terpenes), a full-plant CBD-dominant hemp extract oil, capsules, dried cannabis, or as a prescription liquid solution. CBD does not have the same psychoactivity as THC, and may affect the actions of THC. Although in vitro studies indicate CBD may interact with different biological targets, including cannabinoid receptors and other neurotransmitter receptors, as of 2018 the mechanism of action for its biological effects has not been determined. Laboratory evidence indicated that cannabidiol may reduce THC clearance, increasing plasma concentrations which may raise THC availability to receptors and enhance its effect in a dose-dependent manner. In vitro, cannabidiol inhibited receptors affecting the activity of voltage-dependent sodium and potassium channels, which may affect neural activity. 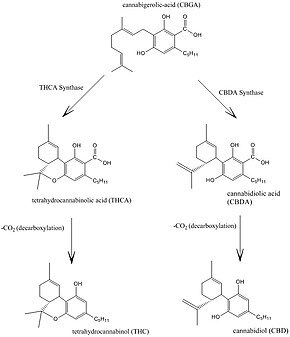 A small clinical trial reported that CBD partially inhibited the CYP2C-catalyzed hydroxylation of THC to 11-OH-THC. Little is known about potential drug interactions but CBD-mediates decrease in clobazam metabolism. Cannabidiol has low affinity for the cannabinoid CB1 and CB2 receptors. Cannabidiol may be an antagonist of GPR55, a G protein-coupled receptor and putative cannabinoid receptor that is expressed in the caudate nucleus and putamen in the brain. It also may act as an inverse agonist of GPR3, GPR6, and GPR12. CBD has been shown to act as a serotonin 5-HT1A receptor partial agonist, and this action may be involved in its antidepressant, anxiolytic, and neuroprotective effects. It is an allosteric modulator of the μ- and δ-opioid receptors as well. The pharmacological effects of CBD may involve PPARγ agonism and intracellular calcium release. The oral bioavailability of CBD is 13 to 19%, while its bioavailability via inhalation is 11 to 45% (mean 31%). The elimination half-life of CBD is 18–32 hours. Cannabidiol is metabolized in the liver as well as in the intestines by CYP2C19 and CYP3A4 enzymes, and UGT1A7, UGT1A9, and UGT2B7 isoforms. CBD may have a wide margin in dosing. Food and beverage products containing CBD were introduced in the United States in 2017. Similar to energy drinks and protein bars which may contain vitamin or herbal additives, food and beverage items can be infused with CBD as an alternative means of ingesting the substance. In the United States, numerous products are marketed as containing CBD, but in reality contain little or none. Some companies marketing CBD-infused food products with claims that are similar to the effects of prescription drugs have received warning letters from the Food and Drug Administration for making unsubstantiated health claims. 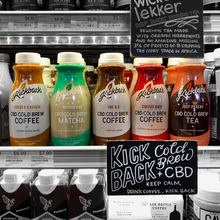 In February 2019, the New York City Department of Health announced plans to fine restaurants that sell food or drinks containing CBD, beginning in October 2019. Selective breeding of cannabis plants has expanded and diversified as commercial and therapeutic markets develop. Some growers in the U.S. succeeded in lowering the proportion of CBD-to-THC to accommodate customers who preferred varietals that were more mind-altering due to the higher THC and lower CBD content. In the USA, hemp is classified by the federal government as cannabis containing no more than 0.3% THC by dry weight. This classification was established in the 2018 Farm Bill and was refined to include hemp-sourced extracts, cannabinoids, and derivatives in the definition of hemp. CBD does not appear to have any psychotropic (“high”) effects such as those caused by ∆9-THC in marijuana, but may have anti-anxiety and anti-psychotic effects. As the legal landscape and understanding about the differences in medical cannabinoids unfolds, experts are working to distinguish “medical marijuana” (with varying degrees of psychotropic effects and deficits in executive function) – from “medical CBD therapies” which would commonly present as having a reduced or non-psychoactive side-effect profile. In the United States, CBD’s legal status depends on the source from which it is derived. When derived from marijuana it is a schedule 1 controlled substance under the federal Controlled Substances Act (CSA). This is because the CSA’s definition of marijuana (spelled “marihuana”) includes “all parts” of the cannabis plant. When it is the investigative new drug Epidiolex it is schedule 5 (see below). However, when CBD is derived from hemp or some other lawful source it is not a controlled substance. Section 10113 of the Agricultural Improvement Act of 2018 defines “hemp” as “the plant Cannabis sativa L. and any part of that plant, including the seeds thereof and all derivatives, extracts, cannabinoids, isomers, acids, salts, and salts of isomers, whether growing or not, with a delta-9 tetrahydrocannabinol concentration of not more than 0.3 percent on a dry weight basis.” Hemp is excluded from the definition of marijuana under the Controlled Substances Act (CSA). CBD is not specifically scheduled in the CSA. It is therefore lawful when derived from hemp, which is not a controlled substance and the definition of which includes “cannabinoids“. CBD is a cannabinoid. Some manufacturers ship CBD products nationally, an illegal action which the FDA has not enforced in 2018, with CBD remaining the subject of an FDA investigational new drug evaluation, and is not considered legal as a dietary supplement or food ingredient as of December 2018[update]. Federal illegality has made it difficult historically to conduct research on CBD. CBD is openly sold in head shops and health food stores in some states where such sales have not been explicitly legalized. Following a change in legislation in 2017, CBD was changed from a schedule 9 drug to a schedule 4 drug, meaning that it is legally available in Australia. The passing of the Misuse of Drugs (Medicinal Cannabis) Amendment Act in December 2018 means some products containing cannabidiol (CBD) are now prescription medicines only. Cannabidiol is no longer a controlled drug in New Zealand under the Misuse of Drugs Act. It is a prescription medicine under the Medicines Act provided the product contains no more than two percent THC of total CBD. In 2017 under the previous government, Associate Health Minister Peter Dunne had made changes to the regulations so that restrictions would be removed, which meant a doctor was able to prescribe cannabidiol to patients. In 2019, the European Commission announced that CBD and other cannabinoids would be classified as “novel foods“, meaning that CBD products would require authorization under the EU Novel Food Regulation stating: because “this product was not used as a food or food ingredient before 15 May 1997, before it may be placed on the market in the EU as a food or food ingredient, a safety assessment under the Novel Food Regulation is required.” The recommendation – applying to CBD extracts, synthesized CBD, and all CBD products, including CBD oil – was scheduled for a final ruling by the European Commission in March 2019. If approved, manufacturers of CBD products would be required to conduct safety tests and prove safe consumption, indicating that CBD products would not be eligible for legal commerce until at least 2021. Until 2017, products containing cannabidiol marketed for medical purposes were classed as medicines by the UK regulatory body, the Medicines and Healthcare products Regulatory Agency (MHRA) and could not be marketed without regulatory approval for the medical claims. As of 2018[update], cannabis oil is legal to possess, buy, and sell in the UK, providing the product does not contain more than 0.2% THC and is not advertised as providing a medicinal benefit. In January 2019, the UK Food Standards Agency indicated it would regard CBD products, including CBD oil, as a novel food in the UK, having no history of use before May 1997, and indicating such products must have authorization and proven safety before being marketed. As of 2016[update], there was only limited high-quality evidence for cannabidiol having any neurological effect in people. ^ a b Mechoulam R, Parker LA, Gallily R (November 2002). “Cannabidiol: an overview of some pharmacological aspects”. Journal of Clinical Pharmacology. 42 (11 Suppl): 11S–19S. doi:10.1002/j.1552-4604.2002.tb05998.x. PMID 12412831. ^ a b Scuderi C, Filippis DD, Iuvone T, Blasio A, Steardo A, Esposito G (May 2009). “Cannabidiol in medicine: a review of its therapeutic potential in CNS disorders”. Phytotherapy Research (Review). 23 (5): 597–602. doi:10.1002/ptr.2625. PMID 18844286. ^ a b c Devinsky, Orrin; Cilio, Maria Roberta; Cross, Helen; Fernandez-Ruiz, Javier; French, Jacqueline; Hill, Charlotte; Katz, Russell; Di Marzo, Vincenzo; Jutras-Aswad, Didier; Notcutt, William George; Martinez-Orgado, Jose; Robson, Philip J.; Rohrback, Brian G.; Thiele, Elizabeth; Whalley, Benjamin; Friedman, Daniel (22 May 2014). “Cannabidiol: Pharmacology and potential therapeutic role in epilepsy and other neuropsychiatric disorders”. Epilepsia. 55 (6): 791–802. doi:10.1111/epi.12631. PMC 4707667. PMID 24854329. ^ a b c Campos AC, Moreira FA, Gomes FV, Del Bel EA, Guimarães FS (December 2012). “Multiple mechanisms involved in the large-spectrum therapeutic potential of cannabidiol in psychiatric disorders”. Philosophical Transactions of the Royal Society of London. Series B, Biological Sciences (Review). 367 (1607): 3364–78. doi:10.1098/rstb.2011.0389. PMC 3481531. PMID 23108553. ^ a b c d Boggs, Douglas L; Nguyen, Jacques D; Morgenson, Daralyn; Taffe, Michael A; Ranganathan, Mohini (6 September 2017). “Clinical and preclinical evidence for functional interactions of cannabidiol and Δ9-tetrahydrocannabinol”. Neuropsychopharmacology. 43 (1): 142–154. doi:10.1038/npp.2017.209. ISSN 0893-133X. PMC 5719112. PMID 28875990. ^ a b c d e Pisanti S, Malfitano AM, Ciaglia E, Lamberti A, Ranieri R, Cuomo G, Abate M, Faggiana G, Proto MC, Fiore D, Laezza C, Bifulco M (July 2017). “Cannabidiol: State of the art and new challenges for therapeutic applications”. Pharmacol. Ther. 175: 133–150. doi:10.1016/j.pharmthera.2017.02.041. PMID 28232276. ^ a b c Iseger TA, Bossong MG (March 2015). “A systematic review of the antipsychotic properties of cannabidiol in humans”. Schizophrenia Research. 162 (1–3): 153–61. doi:10.1016/j.schres.2015.01.033. PMID 25667194. ^ a b Laun AS, Shrader SH, Brown KJ, Song ZH (June 2018). “GPR3, GPR6, and GPR12 as novel molecular targets: their biological functions and interaction with cannabidiol”. Acta Pharmacol. Sin. 40 (3): 300–308. doi:10.1038/s41401-018-0031-9. PMID 29941868. ^ a b c “FDA approves first drug comprised of an active ingredient derived from marijuana to treat rare, severe forms of epilepsy”. US Food and Drug Administration. 25 June 2018. Retrieved 25 June 2018. ^ a b c d “DEA reschedules Epidiolex, marijuana-derived drug, paving the way for it to hit the market”. CNBC. September 27, 2018. ^ a b Angell T (13 August 2018). “UN Launches First-Ever Full Review Of Marijuana’s Status Under International Law”. Marijuana Moment. Retrieved 1 November 2018. ^ a b Stockings E, Zagic D, Campbell G, Weier M, Hall WD, Nielsen S, Herkes GK, Farrell M, Degenhardt L (July 2018). “Evidence for cannabis and cannabinoids for epilepsy: a systematic review of controlled and observational evidence”. J. Neurol. Neurosurg. Psychiatry. 89 (7): 741–753. doi:10.1136/jnnp-2017-317168. PMID 29511052. ^ a b Blessing EM, Steenkamp MM, Manzanares J, Marmar CR (October 2015). “Cannabidiol as a Potential Treatment for Anxiety Disorders”. Neurotherapeutics. 12 (4): 825–36. doi:10.1007/s13311-015-0387-1. PMC 4604171. PMID 26341731. ^ a b Prud’homme M, Cata R, Jutras-Aswad D (2015). “Cannabidiol as an Intervention for Addictive Behaviors: A Systematic Review of the Evidence”. Substance Abuse. 9: 33–8. doi:10.4137/SART.S25081. PMC 4444130. PMID 26056464. ^ Ghovanloo MR, Shuart NG, Mezeyova M, Dean RA, Ruben PC, Goodchild SJ (September 2018). “Inhibitory effects of cannabidiol on voltage-dependent sodium currents”. Journal of Biological Chemistry. 293 (43): 16546–16558. doi:10.1074/jbc.RA118.004929. PMC 6204917. PMID 30219789. ^ Nadulski T, Pragst F, Weinberg G, Roser P, Schnelle M, Fronk EM, Stadelmann AM (December 2005). “Randomized, double-blind, placebo-controlled study about the effects of cannabidiol (CBD) on the pharmacokinetics of Delta9-tetrahydrocannabinol (THC) after oral application of THC verses standardized cannabis extract”. Ther Drug Monit. 27 (6): 799–810. doi:10.1097/01.ftd.0000177223.19294.5c. PMID 16306858. ^ Lucas, Catherine J.; Galettis, Peter; Schneider, Jennifer (November 2018). “The pharmacokinetics and the pharmacodynamics of cannabinoids: The pharmacokinetics and the pharmacodynamics of cannabinoids”. British Journal of Clinical Pharmacology. 84 (11): 2477–2482. doi:10.1111/bcp.13710. PMC 6177698. PMID 30001569. ^ a b Resstel LB, Tavares RF, Lisboa SF, Joca SR, Corrêa FM, Guimarães FS (January 2009). “5-HT1A receptors are involved in the cannabidiol-induced attenuation of behavioural and cardiovascular responses to acute restraint stress in rats”. British Journal of Pharmacology. 156 (1): 181–8. doi:10.1111/j.1476-5381.2008.00046.x. PMC 2697769. PMID 19133999. ^ a b Russo, E. B. (2008). “Cannabinoids in the management of difficult to treat pain”. Therapeutics and Clinical Risk Management. 4 (1): 245–259. doi:10.2147/TCRM.S1928. PMC 2503660. PMID 18728714. ^ “Sativex Oromucosal Spray”. Medsafe, New Zealand Medicines and Medical Devices Safety Authority. 19 December 2018. Retrieved 3 April 2019. ^ “The 2018 Farm Bill Federally Legalizes Hemp & CBD Products”. Big Sky Botanicals. Retrieved 26 March 2019. ^ a b “Industrial hemp”. Department of Agriculture, State of Colorado. 2018. Retrieved 14 September 2018. ^ a b c “State Medical Marijuana Laws”. National Conference of State Legislatures. 27 April 2018. Retrieved 14 May 2018. ^ “CBD products”. www.health.govt.nz. Retrieved March 10, 2019. ^ a b c d Will Chu (31 January 2019). “Updated EC ruling for CBD classes supplement ingredient as Novel Food”. NutraIngredients.com, William Reed Business Media Ltd. Retrieved 1 January 2019. ^ a b “CosIng – Cosmetics – Cannabidiol”. European Commission. Retrieved December 4, 2016. ^ “What are the rules about cannabis oil in the UK?”. BBC News – Health. 26 July 2018. Retrieved 8 February 2019. ^ “Products Containing Cannabidiol (CBD) – Overview”. FormulaSwiss.com. Retrieved March 14, 2019.